Try this summer-inspired meal for dinner or make it ahead of time for lunches. Whenever you eat it you’ll be rewarding your body with protein, veggies, healthy fats, and whole grains. Ahead of time, prepare brown rice as per package instructions. In a bowl, combine shrimp, oil, paprika, garlic powder, sea salt, thyme, black pepper, basil and red pepper flakes. Mix until shrimp is well coated. Heat a skillet over medium heat. Transfer shrimp an seasonings to skillet and cook until shrimp appears browned/blackened (about 5 – 10 minutes). 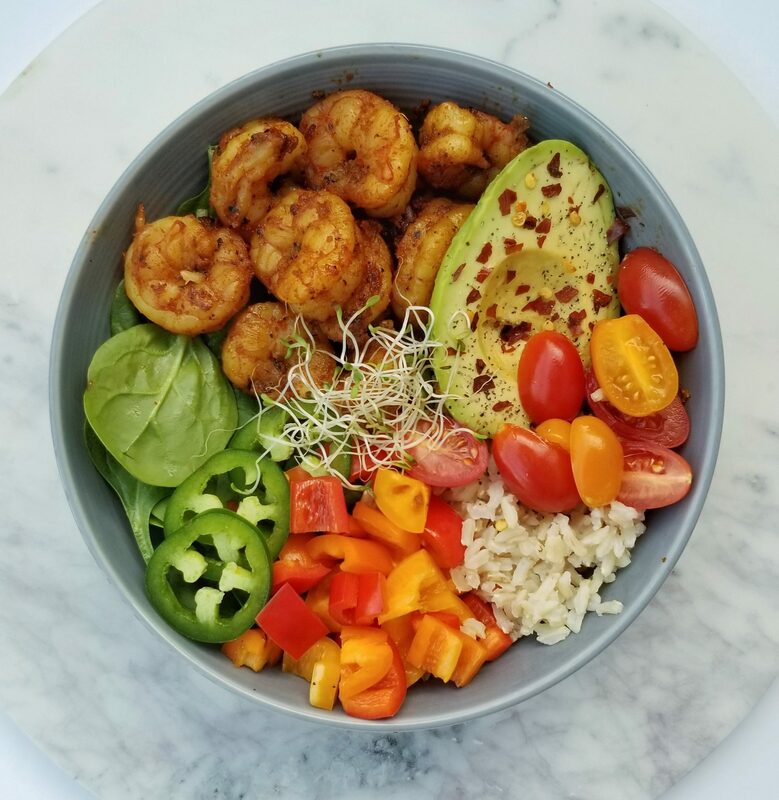 While shrimp is cooking, assemble the bowls. Divide bell peppers, rice, spinach, tomatoes, avocado, and hot peppers between the 2 bowls. When the shrimp are done, divide between the 2 bowls. OPTIONAL: Drizzle with Bolthouse Cilantro Avocado Dressing.